For the last couple of years we’ve been posting “One on One” pieces from SFMOMA curators or staff. Now the column will feature artists, writers, poets, curators, and others, from around the country, responding however they wish to a collection work of their choosing. You can follow the series here. Today, we are very pleased to welcome Lindsey Westbrook, former SFMOMA publications coordinator. NB: click pics for a better view. 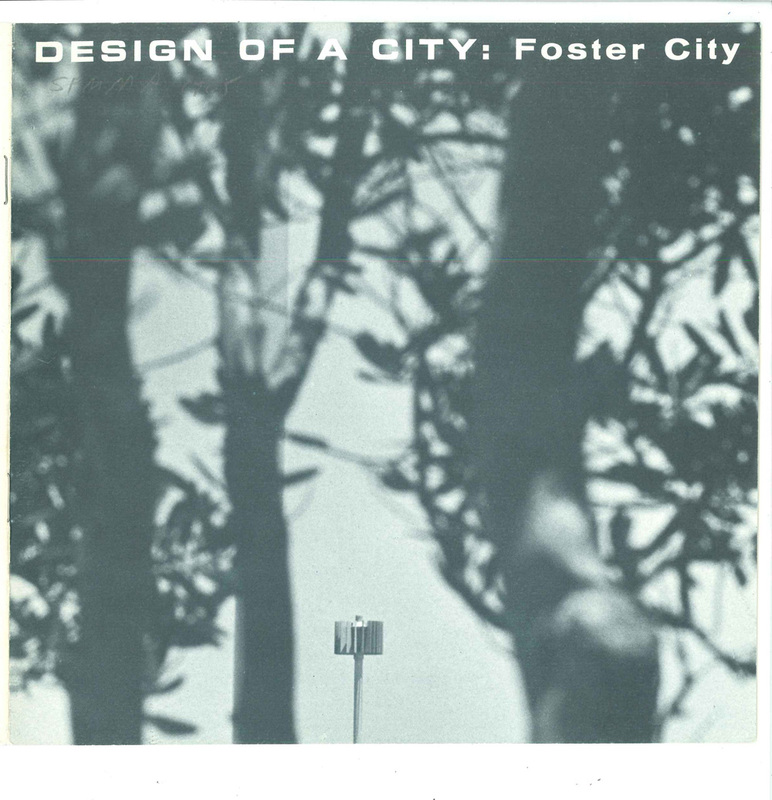 Design of a City: Foster City from the SFMOMA archives. It was an extremely nerdy moment, even by this editor’s decidedly nerdy personal standards. 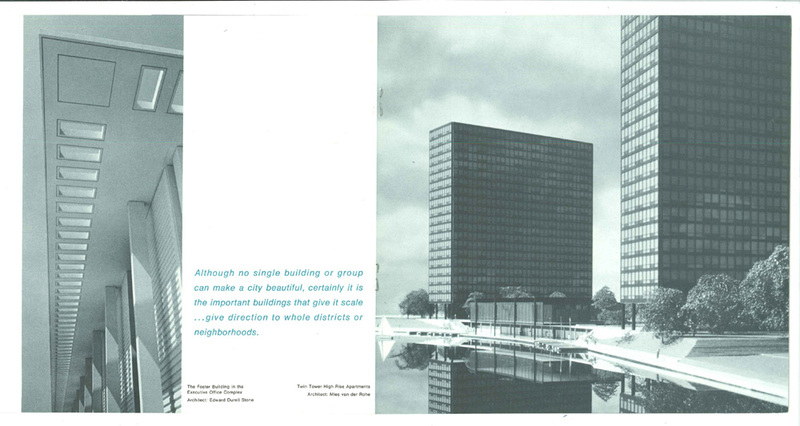 In the SFMOMA library’s collection of old brochures, of all the things to stumble across: the brochure that accompanied a 1965 Architecture & Design exhibition devoted to Foster City. I live in Foster City. I live here because it is convenient, not because (or so I had thought until that moment) it is a remarkable place. Indeed, compared to almost any other city it might seem just a suburb and no more, lacking even what most would consider essentials: a high school, for instance, or a downtown. 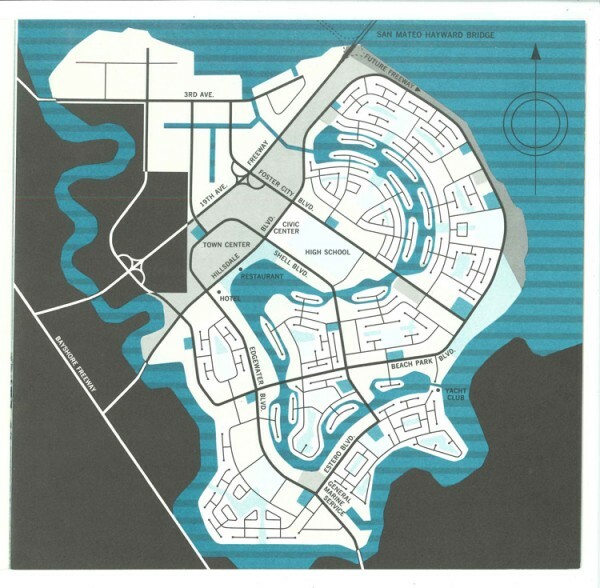 1965 was one year after the founding of Foster City and the construction of my neighborhood; the whole city is built on landfill, a bulbous extension into the Bay. At the time of the exhibition much of Foster City was still being built, although its final shape had already been decided, and this fact in itself, I realized, is part of what makes the place remarkable. The brochure revealed Foster City as a singular work of graphic and industrial design, created by an identifiable author (Jack Foster, an actual guy, who lived a couple of blocks from my house), in a particular style (1960s modern, Eichlers abounding), conceived as a unified, entirely planned whole. I was already, of course, familiar with its cleverly designed waterways, but I hadn’t previously appreciated its also-nautically-themed fire hydrants, lampposts, street names, and city logo. In my mind the SFMOMA exhibition instantly gave Foster City history, legitimacy, context, aesthetic value. I spent a lot of time with that brochure. Joining the Foster City Historical Society was to my geeky mind the obvious next step (over protests from a few friends that a historical society devoted to something younger than they were made no sense). And from there: attending local history days, watching FCTV (which features beautiful Foster City–themed art photography, plus soothing PowerPoints of local announcements guaranteed to defeat insomnia in a single blow), and buying the Images of America: Foster City book (which includes fascinating photos of barges hauling dirt down from San Bruno to fill the land upon which my house now rests). At one particularly awesome meeting of the historical society, I met the guy who owned the company that paved Foster City, who is fairly ancient yet still conveyed with great enthusiasm his pride in the paving job. There will never be another city in the Bay Area that is created in this way, from scratch. I’m sure the local wildlife is thrilled to hear that there will be no more such large-scale encroachments into their watery habitat, and I do generally tend to side with the wildlife, but that doesn’t mean I can’t still appreciate the place where I live. I also appreciate SFMOMA as a special place, attuned as it is to aesthetic works in the moment of their creation, willing and able to bestow upon them the legitimacy they deserve, and aware of what is being risked when those claims are staked. As I perused the 75th anniversary show recently, reading Grace McCann Morley’s ardent defenses of Paul Klee and Jackson Pollock against early detractors, it was clear that these ideas were central to the museum from the moment of its founding. Morley understood the power of the institution to bring validity and respect to artistic endeavors and was strong in her convictions about who and what deserved it. It’s unfortunate, and a little inexplicable, that Morley isn’t a better-known figure, at least in local history if not in art history. San Francisco suffers from a bit of an art-world inferiority complex, and inferiority complexes are always self-fulfilling. I’m awed and inspired by Morley’s indefatigable enthusiasm and energy, her championing of art and the museum. She clearly had a great passion for the place she lived. Lindsey Westbrook was publications coordinator at SFMOMA from 2003 to 2007, and she is now managing editor at California College of the Arts in San Francisco. Her sideline editorial involvements include The Exhibitionist, a journal devoted to curatorial practice; DekeDickerson.com, a musician’s website and career-archive-in-progress; and a crazy-making array of other freelance projects. For many years she wrote weekly art review columns for the San Francisco Bay Guardian and the East Bay Express. Photography credits for Design of a City: Michael Bry, Ernest Braun, Christopher of San Mateo, Vano-Wells-Fagliano, Hedrich-Blessing, and Tom Moulin.